The bullion 2012 American Silver Eagles were just recently released. To date, the US Mint has not added the 2012 American Silver Eagles to their online shop nor have they announced availability. One coin dealer on the bourse had a $50 gold slug replica of territorial gold. Though still valuable, a previous owner carried the gold slug as a pocket piece. As a result, the gold showed hairlines in the replica design. But, the exonumia was definitely interesting and also hefty at 2 1/2 ounces of gold. 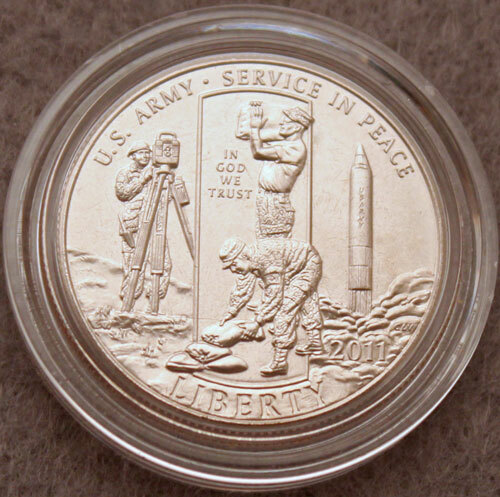 On Sunday, people also searched for the 2011 US Army commemorative coins. The US Mint discontinued their sales of the coins on December 16, 2011. Perhaps people's interest in the US Army commemorative coins stemmed from the December 30 article in Numismatic News titled New Key to Commem Halves. 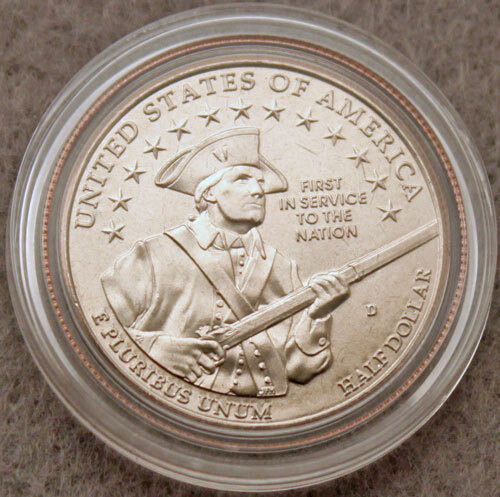 The article described the Army Uncirculated half dollar as having a less than 40,000 population making it the lowest mintage to date of the modern commemorative half dollars. Several visitors at our Sunday coin show looked for the relatively new five-piece American Silver Eagle 25th anniversary sets. A few could be found on the bourse, but those sets are definitely not a commodity. We first talked about the 25th Anniversary sets on October 19 with the blog post: The American Eagle Silver Bullion Coins. Then, remember the issues when the sets were released on October 27? We had a few posts discussing those challenges including Does the US Mint Play Favorites with Coin Dealers? The US Mint Apologizes, Was the US Mint's Apology to Soften the Blow? and Humor at the US Mint's Expense. In keeping with the increased interest in silver and gold, some coin dealers on the bourse made available uncirculated bullion versions of the 2012 American Silver Eagles while others had gold Buffalo coins for sale. Let's start the new year with a huge THANK YOU to the hotel personnel for moving the coin show up to the Joe Mack Wilson ballroom. Another huge THANK YOU goes to all the people who came to the first monthly Greater Atlanta Coin Show of the new year. Wow, what a coin show. We had a packed bourse from mid-morning through to mid-afternoon. We recognized faces from earlier shows along with the make-it-to-almost-every-coin-show folks, but there were many new people too. All of you are welcome, and we're glad you came! Though snow was predicted earlier in the week for northern Georgia counties, our area got rain instead. Sunday's bright, sunny day provided a welcome reprieve even though the temperatures remained in the 50s. We must remember, it is January. Several people at the show talked about their visits to the Florida United Numismatics (FUN) coin show in Orlando the previous week. The FUN coin show is the largest in the southeast (maybe the country). The people who went commented that FUN was fun once again this year. Prior to this coin, the 1995 Atlanta Olympics Swimming coin held the lowest mintage of the modern commemorative half dollars. The US Mint struck just over 50,000 of the uncirculated swimming half dollars. Currently, its value is over $100. Will the US Army commemorative half dollar reach a comparable value? Time will answer that question. The US Mint recently discontinued another product that has become somewhat rare on the open market. 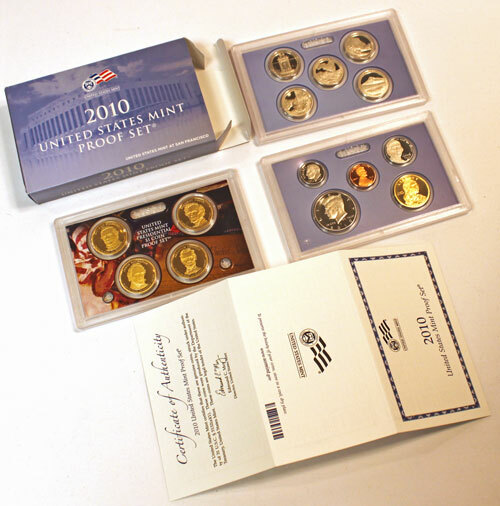 Up until December 30, 2011, the US Mint sold the 2010 Proof Set and 2010 Uncirculated Mint Sets. (No, that's not a typo.) Now, the 2010 Proof Set is tough to find. The 2010 Proof set provided the first five America the Beautiful quarters along with the four presidential golden dollars, the Native American golden dollar, and the standard coins: penny, nickel, dime and half dollar. Listed at less than one million minted, the 2010 Proof Set could become more valuable than its earlier proof set counterparts with their higher mintages. Again, time will reveal their value. In summary, the January 2012 coin show started our 25th year with a bang with a beautiful day, a full complement of coin dealers on the bourse and lots and lots of people visiting the coin show! Mark your calendars for the next coin show on Sunday, February 12, 2012.